North Korea has rejected South Korean calls for an apology over the sinking of a warship, calling it an "intolerable mockery". The move comes as South Korea prepares to mark five years since the Cheonan went down on 26 March 2010 with the loss of 46 lives. Seoul says Pyongyang torpedoed the ship, but North Korea rejects this. South Korea cut almost all trade after the sinking - restrictions which remain in place today. The measures effectively block all inter-Korean economic projects bar production at the joint Kaesong industrial zone. 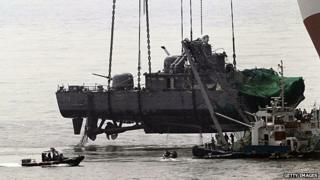 Seoul says they will only be lifted after an apology is issued for the sinking. "The South should clearly understand that its sophism that 'apology' and 'expression of regret' have to precede the lifting of the 'step' can never work," a statement from North Korea's top military body carried by KCNA news agency said. It described the theory that North Korea sank the ship as "fictitious". The warship went down off an island near the disputed inter-Korean western maritime border. An investigation into the disaster involving South Korean and international experts found that a North Korean torpedo sank the ship. Pyongyang does not accept this and offered at the time to conduct its own investigation, an offer that was turned down. Since then, ties between the two nations - which remain technically at war - have remained icy. There has also been no movement since 2009 on six-nation talks aimed at ending North Korea's nuclear ambitions. Pyongyang has also threatened to respond with "firepower" to South Korean activists who want to use balloons to fly propaganda leaflets and DVDs of The Interview - a film depicting a plot to assassinate North Korean leader Kim Jong-un - across the inter-Korean border. On Monday the activists postponed their plan. The organiser said they would delay until after the Cheonan anniversary on Thursday but suggested the delay was contingent on an apology over the sinking.